Some 152,000 former customers of defunct bank Northern Rock are to receive an average of £1,775 in compensation following a paperwork error. 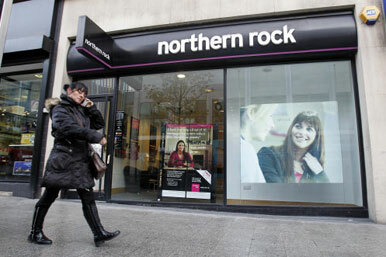 Northern Rock Asset Management (NRAM), the state-owned remnant of Northern Rock, will pay out £270 million in refunded interest after the bank failed to make mandatory disclosures in customer letters since 2008. UK Asset Revolution, NRAM's holding company, will contact potentially affected customers in writing with further information in the next few days. The refund is likely to increase public sector net borrowing for 2012/2013, Treasury economic secretary Sajid Javid said in a statement to Parliament. However, the refunds are "not expected to delay materially" the timing of NRAM's repayment of £19.6 billion of Government funding. Speaking at Treasury questions, Chancellor George Osborne said customers who had loans below £25,000 were affected and blamed "an error originating in 2008 when Northern Rock was in public ownership". He told the Commons: "Some customers with certain types of mainly unsecured personal loans were not given all the mandatory information in their statements which they were entitled to by law. As a result, interest payments on these loans are not legally enforceable." UK Asset Revolution (UKAR) identified certain loans where the documentation was not compliant with Consumer Credit Act (CCA) requirements. UKAR chief executive Richard Banks said: "NRAM is acting in accordance with its legal responsibilities and we are determined to do the right thing for customers and the taxpayer. "We will be writing to all customers who are affected and advising them on next steps. We have not received any complaints or claims as a result of this matter and as far as we are aware, it has not resulted in financial loss for customers." More than 46,000 of 106,000 the complaints received by the FOS in the second half of last year related to payment protection insurance (PPI). And the organisation is expecting to receive a record 165,000 PPI complaints in 2012/2013. The huge numbers are due to the PPI mis-selling scandal that should now be a thing of the past, but there is no doubt that the insurance, which can add thousands to the cost of a loan, is highly unpopular! Complaints about mortgages jumped by 38% in the last six months of last year, the FOS figures show, compared to an increase of just 5% in investment-related complaints. Common gripes about mortgages include the exit penalties imposed should you want to sell up or change you mortgage before a fixed or discounted deal comes to an end, and the high arrangement fees charged by many lenders. While there is nothing in the data released by the FOS about the number of complaints relating to savings accounts, hard-pressed savers have been struggling with low interest rates for several years now. You can get up to 3.10% with Santander's easy-access eSaver account, but many older accounts are paying 1.00% or less and even this market-leading offer includes a 12-month bonus of 2.60% - meaning that the rate will plummet to just 0.50% after the first year. Banks are imposing the highest authorised overdraft interest rates since records began, with today's borrowers paying an average of 19.47%, according to the Bank of England. A typical Briton with an overdraft of £1,000 is therefore forking out around £200 in interest charges alone. Coupled with meagre returns on savings, it's enough to make your blood boil! While authorised overdrafts may seem expensive, going into the red without permission will cost you even more due to huge penalty fees. Barclays, for example, charges £8 (up to a maximum of £40 a day) each time that there is not enough money in your account to cover a payment. If you need to send money abroad, the likelihood is that your bank will impose transfer charges - and offer you a poor rate of exchange. Someone transferring a five-figure sum could easily lose out by £500 or more as a result. The good news, however, is that you can often get a better deal by using a currency specialist such as Moneycorp. Automated telephone banking systems, not to mention call centres in far-flung parts of the world, are one of our top gripes - especially as we often encounter them when we are already calling to report a problem. In the words of one disgruntled customer: "What is it about telephone banking that turns me into Victor Meldrew? Well, maybe it's the fourteen security questions, maybe it's the range of products that they try to push or maybe it's because I'm forced to listen to jazz funk at full volume while my phone bill soars. "Actually though, I think it's because the people I eventually speak to rarely seem able to solve the issue I'm calling about." The days of a personal relationship with your bank manager are long gone - for the huge majority of us at least. When ethical Triodos Bank investigated recently why around 9 million Britons would not recommend their banks to a friend or relative, it found that almost a third felt they were not treated as individuals. Another 40%, meanwhile, were simply disappointed with the customer service they received. When you're in a rush, the last thing you want to do is wait in a long queue at your local branch. Researchers at consumer champion Which? recently found that most people get seen within 12 minutes, but you could have a much longer wait if you go in at a busy time. Frustrating stuff! The Triodos Bank research also indicated that the bonus culture that ensured the bank's high-flying employees received large salaries, even when it was making a loss at the taxpayer's expense, was hugely unpopular with consumers. About a quarter of those who would not recommend their current banks said this was the main reason why. And with RBS executives sharing a £785 million bonus pool despite the bank, which is 82% publicly owned, making a loss of £2 billion last year, it's not hard to see why. What doesn't the Financial Services Compensation Scheme cover?